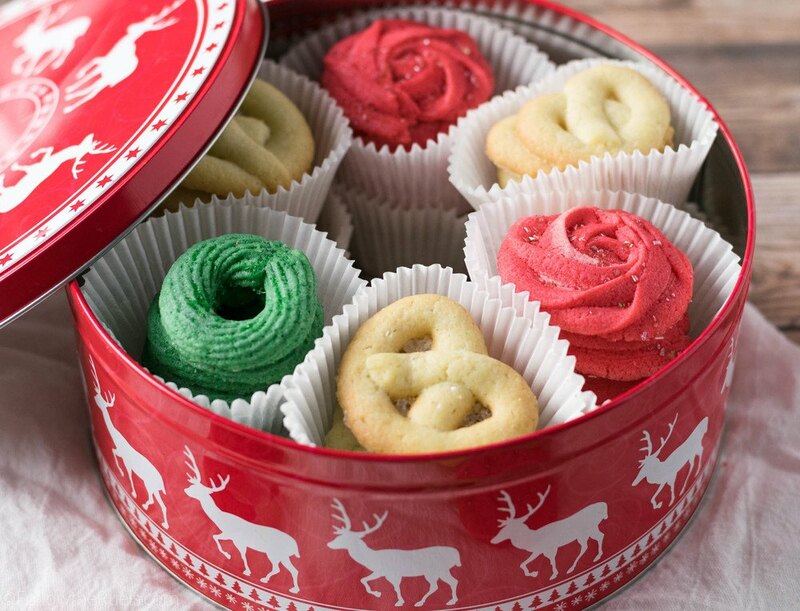 Danish butter cookies are one of my favorites! I don't know about you, but around the holidays one of those blue tins always popped up around my house. Whether we got it as a gift or bought it to give as a gift, which I would proceed to eat anyways (sorry, Mom). Preheat oven to 325 degrees. Line a baking sheet with parchment and set aside. In a large bowl, cream together butter and sugar until light and fluffy. Mix in egg, vanilla, and coconut extract. Add flour and salt to the bowl and mix until combined. The dough should be very sticky. If coloring your dough, add food coloring to the dough and mix until it is a consistent color. Place dough into piping bags fitted with tip or nozzle of choice (see notes for the tips used for these cookies). Squeeze dough out into desired shape about 1 inch apart on the baking sheet. Sprinkle with sanding sugar and bake for 15 to 20 minutes, until just golden brown around the edges. Allow to cool on the pan for 5 minutes before transferring to a wire rack. Store in an airtight container for up to a week.